Since its establishment in 2002 as a set of 7 Regional Centers, the Centers for Ocean Sciences Education Excellence (COSEE) has evolved into a coordinated Network comprised of 12 thematic and regional Centers located around the United States including over 270 institutional partners with close to two thousand Network members. The mission of the COSEE Network is to spark and nurture collaborations among research scientists and educators to advance ocean discovery and make known the vital role of the ocean in our lives. The mission reflects the three-fold partnership, which composes each COSEE Center-partnerships between formal and informal education institutes and research institutes. Connecting informal and formal education partners and the public to the ocean sciences enterprise. 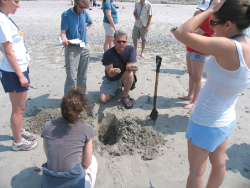 COSEE’s well-established partnerships with formal and informal education institutions will ensure that future advances and discoveries in ocean sciences research are efficiently integrated into K-16 education programs and instructional materials, as well as into public programming across the country. As the Network looks into its future, exciting opportunities are on the horizon.